We provide both NC and CNC hdyraulic press brake. 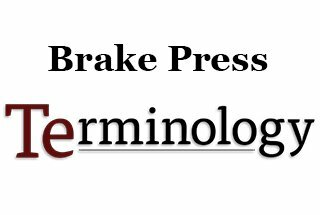 No matter you’re press brake manufacturers, end users, dealers, service providers, below 45 brake press terminology will help you know the professional expressions. Back Gauge – An adjustable stop, automated on modern CNC machines, which acts as a stop for the workpiece centering the bend line over the v opening of the die. Back Gauge Origin – A preset position for the back gauge, set form the center of the v opening. The back gauge origin is typically 4” from the center of the v. This origin will determine all positioning of the back gauge, so it’s crucial that it runs even to the die. Bed Plate – The stabilizing and supporting foundation of any Brake Press. This feature is often at ground level, though for some heavy duty brakes and stamping machines it will be located below ground and isolated from the floor in order to minimize the transfer of vibration from the machine to the floor. Bottom Dead Center – This is the position of the brake when it is fully closed into the die. This position will be different for each die set. Capacity / Tonnage – This is going to be the maximum force that the press brake can exert on the workpiece. Clutch – The mechanism which engages the flywheel on a mechanical brake, transferring its energy through a gear set to the crankshaft bring tonnage down on the workpiece. 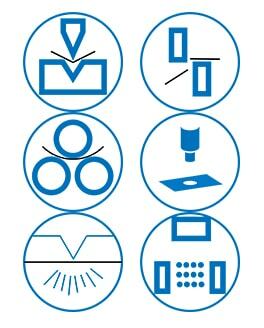 CNC – An abbreviation for Computer Numerical Control, this is a term applied to computer controlled press brakes. Crank Shaft – The component of a mechanical press brake which transfers the energy of the flywheel to the ram. Day Light Through – A term used to describe the maximum open space a brake can open given a specific die set. Down Acting Brake – A press brake where the upper beam moves the punch down into the die. Flywheel – A large weighted wheel which is spun to store the energy necessary to close and re-open a mechanical press brake. Foot Pedal – The part of a mechanical press brake which is used by the operator to engage the clutch. Gibb Adjustment – Fine tuning motion control for the beam which will move. High / Low-Speed Change – The point during the bending operation where the brake transitions from a high-speed motion, to approach the workpiece, to a low-speed motion, to bend the workpiece. The bending is done at a slower rate to prevent dangerous whip up of the workpiece. Housing Brace – A structural component of the upper beam which holds the two driving cylinders of a press brake together. Hydraulic Brake – A press brake which is driven by the high-pressure transfer of a fluid into a cylinder. Hydraulic press brakes can be very accurate and well controlled, so they are the dominant form of computer-controlled precision brakes. Hydro-mechanical Brake – A press brake which uses a flywheel to push fluid to a hydraulic cylinder, offering even tonnage throughout the stroke, an advantage over typical mechanical brakes. Length – The overall working length of the Brake Press beams from left to right. Lower Beam – The lower portion of a press brake which holds the die or rail in position. Mechanical Brake – A press brake which relies on a flywheel and clutch mechanism to mechanically transfer energy to cycle the ram. Found on older machines this type of brake suffers from uneven tonnage application and poor vertical control. Mechanical Stop – A physical stop which prevents older mechanical brakes from over traveling and improves repeatability. Pinch Point – The moment the punch touches and begins to apply tonnage to the workpiece. At this point, the back gauge may retract to allow the workpiece to form upwards freely. Pit / No Pit Machine – Whether or not the machine requires a hole in the floor, and subsequent base, to stabilize and secure the lower beam. Pit Machines are going to be much larger than No Pit machines. Ram – Both Upper and Lower Rams are the driving or resisting components of the press brakes. Typically machined from large, strong steel plates, they can be complemented by internal hydraulic cylinders to resist crowning. 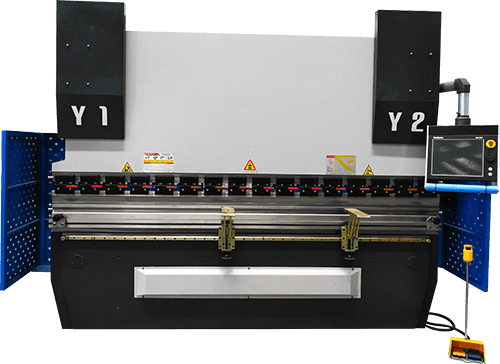 Repeatability – The accuracy with which the press brake is able to return to a specific position. Stroke Length – The maximum open size of the Brake Press, i.e. the distance between the top of the lower beam and the bottom of the upper beam when the brake is fully open and there is no tooling installed. Swing Up Fingers – Special adaption to the back gauge which allows the workpiece to whip upwards without damaging the back gauge. These fingers are able to move freely with the part and out of the way. 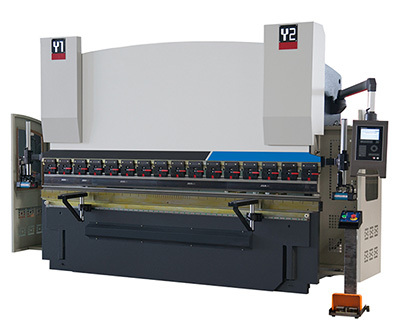 Tandem – Two or more press brakes controlled by the same controller which are used to bend extremely large parts. Throat – The depth of the press brake before the vertical supports limit flange length. Most press brakes are only constrained by the throat of a brake around the driving cylinders. Top Dead Center – The compliment to bottom dead center, this is the position of the press brake when it is opened to its maximum height. Tonnage Control – The ability of the machine to regulate its tonnage up to its maximum tonnage. This is greater with modern hydraulic brakes which can control their tonnage very accurately. Up Acting Brake – A press brake where the lower beam moves the die upward into the punch. Upper Beam – The upper portion of a press brake which holds the punch holder. X-Axis– The front to back motion of the back gauge. The X-Axis controls the flange length, positive motion moves the back gauge towards the operator and results in a smaller flange. X1 Axis – The front to back motion of the left back gauge independent of the right back gauge. X2 Axis – The front to back motion of the right back gauge independent of the left back gauge. X1-X2 – The tilt of the back gauge creating an angled bend line in relation to the back of the workpiece. R-Axis– The vertical motion of the back gauges. R1 Axis – The vertical motion of the Left back gauge independent of the Right back gauge. R2 Axis – The vertical motion of the Right back gauge independent of the Left back gauge. R1-R2 – The tilt of the back gauge creating a vertically shifting backstop used for oddly flanged workpieces. Z-Axis– The left to right motion of the back gauges. This is used when bending with multiple setups down the press brake, allowing the gauges to move with the operator as he moves the workpiece from one setup to the next. Z1 Axis – The left to right motion of the left back gauge. Z2 Axis – The left to right motion of the right back gauge. Y-Axis – The vertical motion of the moving beam. This does not mean the motion of the back gauge. Why the Machine for Sheet Metal Bending Is Been Called Press Brake? How to Calculate Press Brake Stroke? What Is A Press Brake? How to Choose Press Brake Controller, NC or CNC?